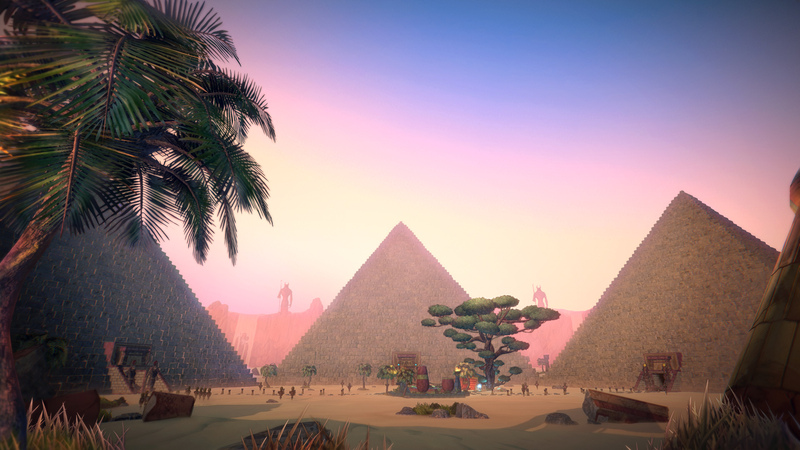 Three pyramids await you when you leave the sarcophagus you awake in. 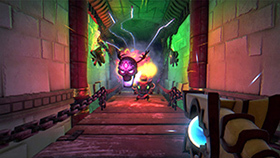 Each one features a different environment, a different set of enemies and powerful bosses whose only aim is to kill you. A lot. The dungeon inside each pyramid is randomly generated each time you play, so every time you die, you have to face a new, unique layout of rooms. 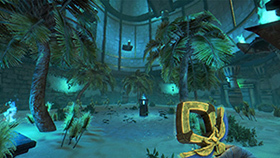 As you explore the vast area in search of special rooms, you will come upon traps, gifts from the Gods and huge enemies. Each time you die, you will come back to life in your sarcophagus outside the pyramid with all your previously earned money intact. Your next step should be obvious: spend the money to acquire skills and abilities. Where? 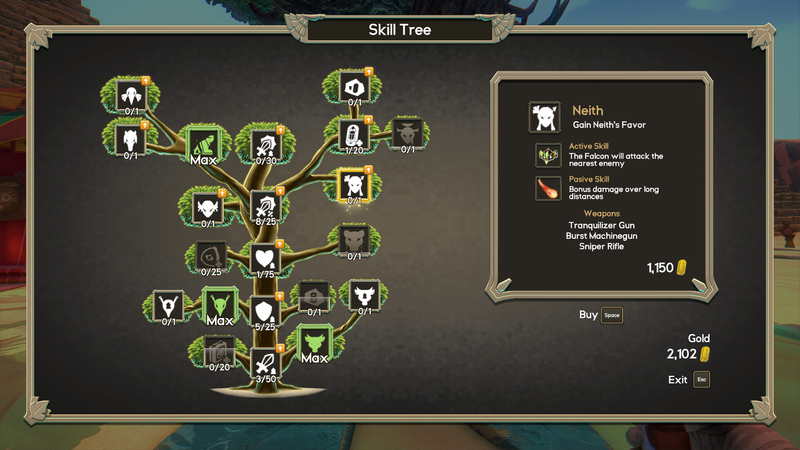 At the Skill Tree! Offer your gold to the Gods to upgrade your skills and, literally, grow your own tree of life. 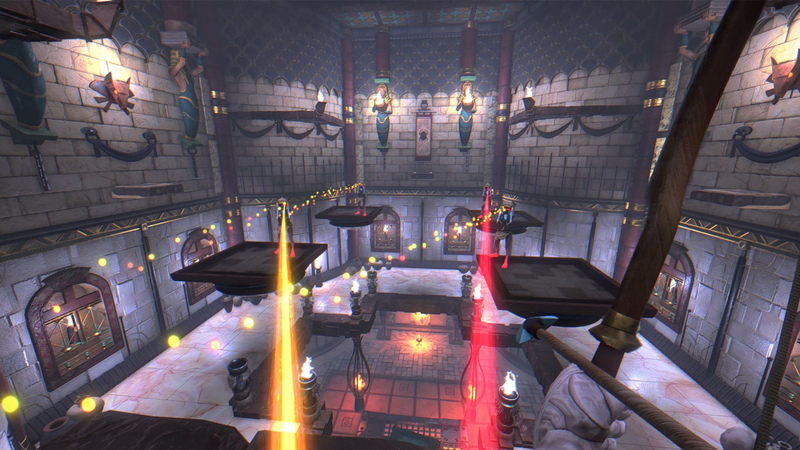 Unlock new classes, abilities and weapons, improve your stats and discover new ways to reach the top of the pyramids. 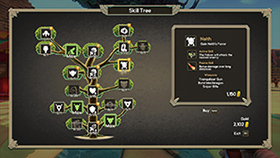 The Skill Tree has it all! Upgrade your character by playing. Every time you play, you get a little stronger. Never go back to square one. Immortal Redneck features more than 50 weapons. There are traditional, magical, mythological, futuristic and just plain weird weapons. You name it, this game has it. There’s even a potato launcher because…why the hell not?! Each of the nine classes offers a different set of weapons, some of which can only be obtained by defeating specific enemies. 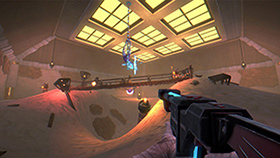 For example, some hold more bullets and some are more powerful. In order to succeed, you’ll have to combine just the right weapons to find your favorite ones. 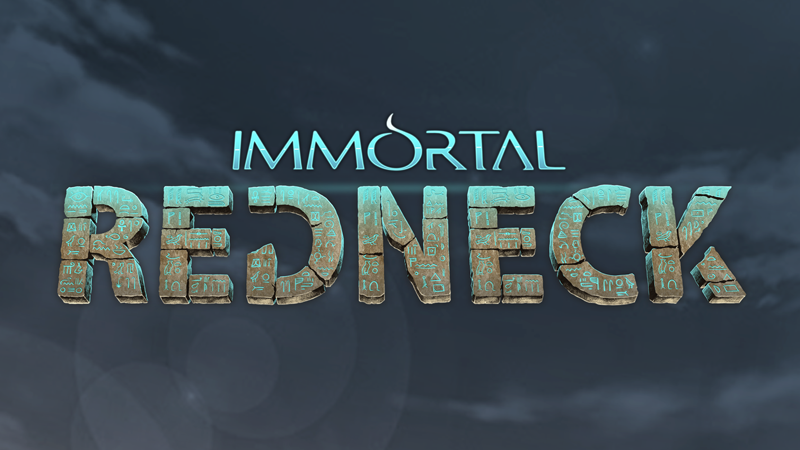 To stay up to date on all news about Immortal Redneck, follow us on social media. looks amazing. where's the female player character? And does it pass the Bechdel test? We'll have a female redneck – or a Redneck Woman, if you know the song – soon enough, no reason to worry! We are just starting with the male concepts and models. Hope you don't see it as a very bad thing, it's just that we found it easier to start with him. And about the Bechdel test, welp, I don't think we are gonna pass it, but just because there won't be any other characters to really speak with, haha. Aww thanks for the reply. No I don't think I see it as a bad thing, we've all been taught to start with a male hero anyway (shonen manga and anime, disney movies, ZX spectrum games, you name it) and women and girls are always expected to identify with a male hero, when men and women are not expected to identify with a female hero, thus making a game or show "for girls". Also, all neutral characters (and all muscular characters) are always coded male, even if it's not your intention. So until I see a female Jackal-god enemy, that looks ripped, I'm thinking "oh ok, this is beautiful but is not going to challenge any stereotypes". And if there is a female Jackal-god enemy whose main skill is "cleverness" or "seduction" instead of brute, mindless force, like her male counterpart, then it's still a double standard. Like how there are no female Minions, because according to their creator women can't be silly or dumb. Passing the Bechdel test isn't a prerequisite for a game or story to be cool (or feminist). 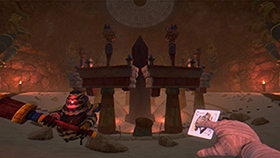 But if the game has two male characters talking to each other (enemy threatening the player, only male pharaohs in the game who utter curses, only a male narrator helping the male player - slipping in male on male interaction is again, super easy, it happens automatically) and no female characters talking to each other, or talking to each other and the content of their interaction being about a male character, then it's skewed, isn't it? Also, is it redneck as in a self-professed politically conservative/racist working class white person, or as in a putdown for a white southerner? i.e. is the player expected to identify/sympathize with your protagonist? 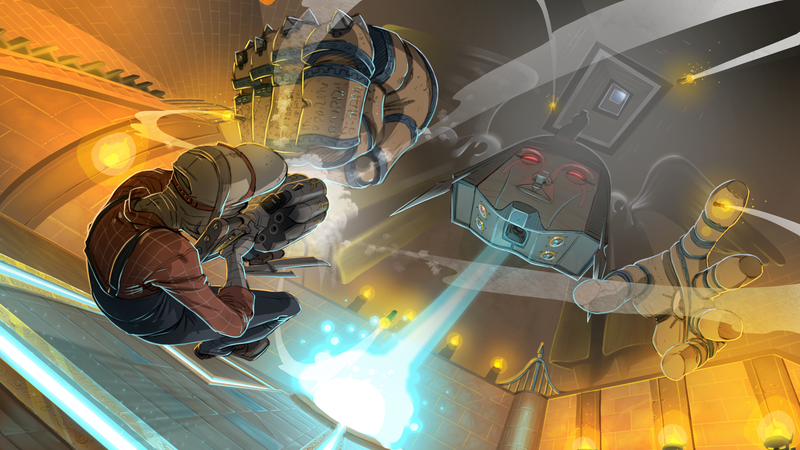 In any case, the mood and concept art is absolutely amazing. I understand your concerns about the male overrepresentation in videogames (and everywhere, actually) but agagin, the male innuendo of the enemies will be almost non existent. They are monsters and the only 'humanlike' one is the archer we posted in the first post. The other other don't have a muscular look at all and can't really be seen as male. At least, that is what we think, when we show them, maybe we are wrong, but hey, we can always learn something and make the proper changes in time. This is why we are posting in here, anyway, so the community can help us a little, haha. And about the character, we never thought of the redneck itself as anything related to politics or social inequality. After all, we are studio from Spain, so our notion of rednecks is limited to the pop representations on TV and movies. Our Immortal Redneck is some sort of Cletus, from The Simpsons. Thanks for your concern, really. I thought the archer's head was the bow at first, haha. I'm from Greece, so it doesn't hit close to home either way, I just thought I'd ask. I get it now! Really nice project, keep it up! And how many people is working on it? Thanks a lot for your comment! Right now, we are ten people, eight working on Immortal Redneck, one with a little side project and a recently incorporated Communnity Manager. 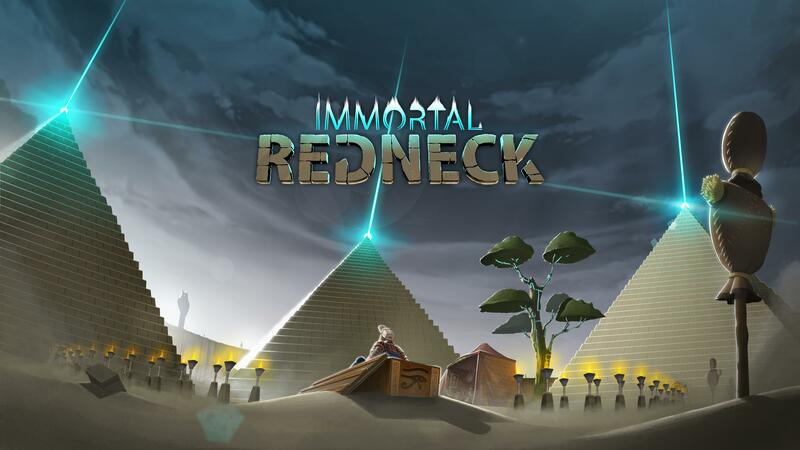 Today I'm showing you two things about Immortal Redneck: our ideas for the bosses and the handgun, the most basic weapon and versatile weapon of the game. About da boss. We don't have a name yet, because we are trying to come up with something both silly and that pass as something egyptian. Thankfully, we have a piece of art and some very clear ideas about how the players will fight it. As you can see, the boss is big, very big. The idea for the final bosses in Immortal Redneck is for them to hold the upper floor inside the pyramid. 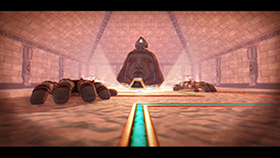 Each pyramid will have two big enemies inside: a midboss and a final boss, but only the last one will serve as a checkpoint, though, so the challenge of finishing just one of the pyramids will be enormous. If you beat the final boss, you could say you have beaten one third of the game. This particular boss is one of the most obvious one to beat. You just have to dodge his attacks and shoot the weak points in the face, but we have yet to decide some of the details about it. It's a very classic design and there are a lot of versions of this kind of big boss, so I hope you like our approach. 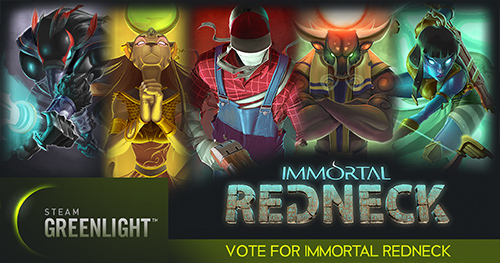 We want Immortal Redneck to be a fun game, not only while you play, but as a whole. That's why we are trying to make a ridiculous background for the protagonist and his weapons. 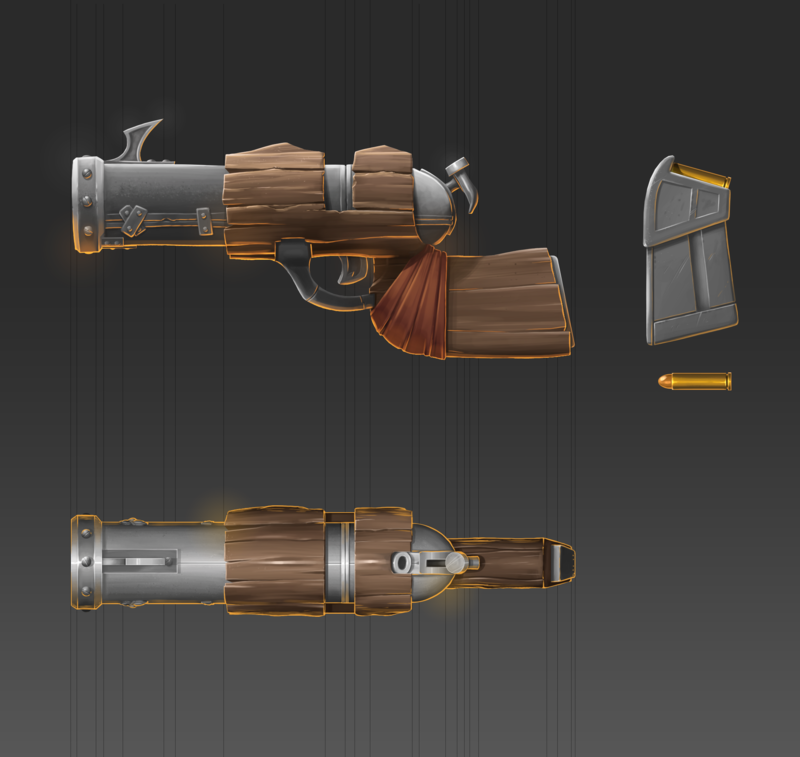 The first one we have almost finished is the handgun, aka Grandpa. The story about this one is probably the most messed up: the redneck's grandpa got mad one morning and left the mortal world with a bang. A literal one, and this handgun is the only thing he left to the poor redneck. 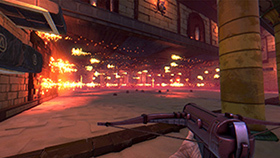 Grandpa is one of the three weapons you'll use with the default class of the game – remember, we'll have nine, each with their own guns and abilities. It's a little slow and it takes some time to reload it, but has a good range and makes some good damage, too. You won't have infinity ammo with it, though, so even if it's the most basic weapon in the game, you'll have to use it carefully. Here is a concept, a 3D render and a gif so you can see how it shoots and reloads. We are putting the final touches to some stuff and improving the hammer animation, but this is almost the final product. And that's all for now. 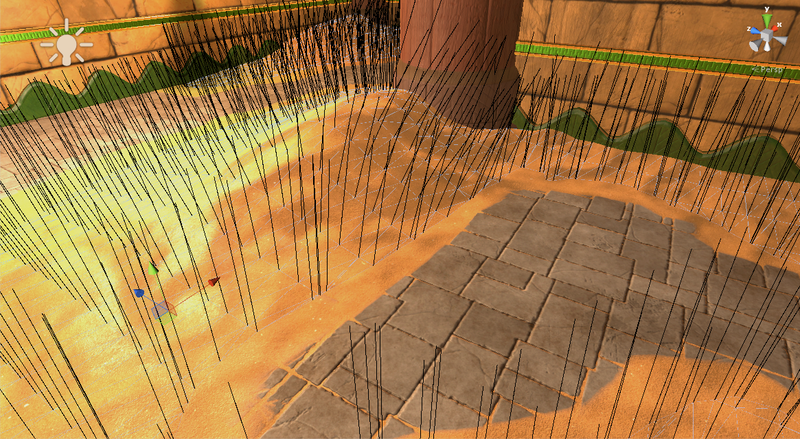 We are still working on the first two enemies animations and AI. Our programmer is almost finished with a warrior, so I hope next week I can tell you about its animation and AI behaviour in longer devlog. If you want some more info about the boss or the gun, we have a little longer devlog in the studio devlog. This game looks amazing! Can't wait to see some gameplay videos! Music that tells a story. New devlog! This one is very simple because it's just a presentation of Immortal Redneck's logo. Do you like it? Hope so. 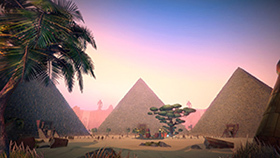 There is very little I can tell you about its design that you can't see in the logo itself: we wanted to insist a in the egyptian/magic aspect of the game and make it very clean and readable at the same time. We did a lot of testing before choosing this one. Take a look. This was one of the first ones we did. We were also trying others names. 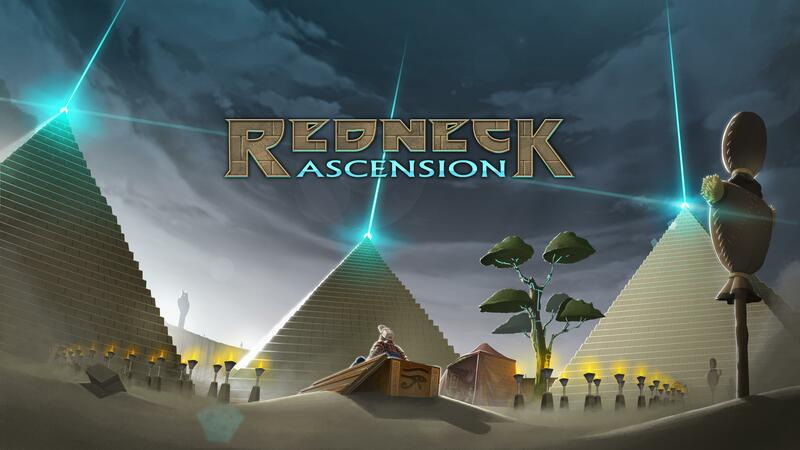 Immortal Redneck was almost named Redneck Ascension. Once we chose a more or less definitive look, we tried new things around it. And that's all for now! If you want to know a little more about how we created the logo, you have a little more info and tests in our official blog. 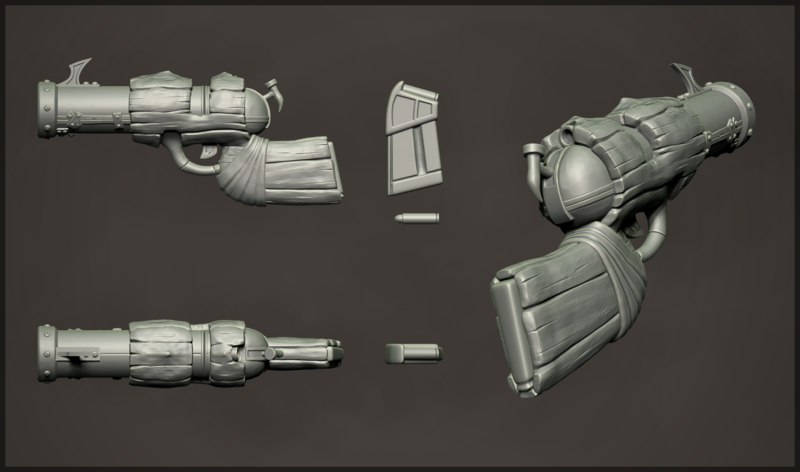 Next week I think we'll have two more guns done and I will show them to you, as well as some notes about the classes we are working on. That's interesting the team didn't like it because that one was my favorite! I think the white and red makes it stand out a lot more. This looks ridiculous & awesome, totally up my alley. As for the logo, the one in your signature is the strongest. Nice! this look really wacky and cool. I really like that handgun, as for the logo the first one is the best indeed. Silly update here. We are finishing the shotgun animation and I wanted to show you. We are adjusting the hammer timming and a few more details. Sorry about the redirection, tigsource needs video embedding, don't you think? Remember when I promised I'd talk about guns? 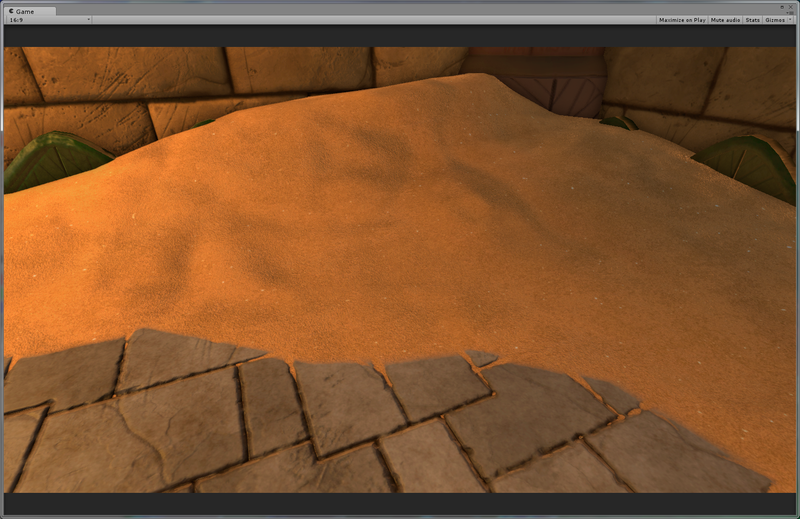 Since some animations are taking a bit of time, I'm gonna show you first our sand rendering. We are kind of proud of how look it looks, so I hope you like it. 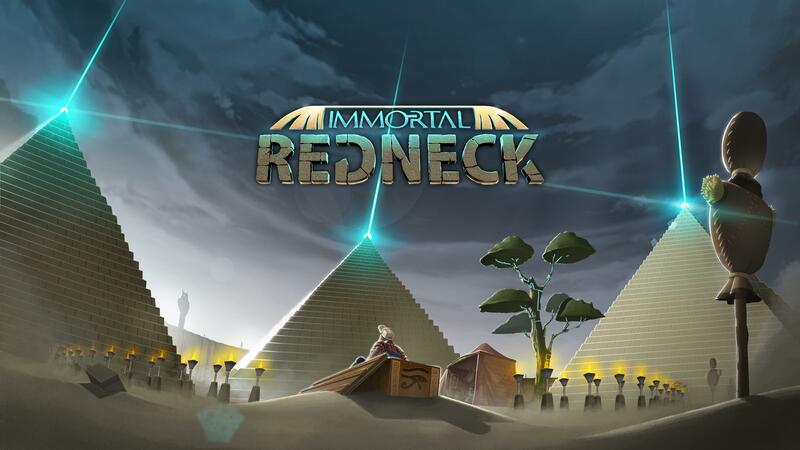 We needed a lot of sand in Immortal Redneck since it's a game set in Egypt. 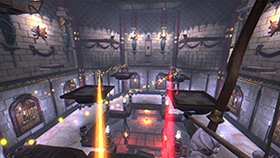 As you can imagine, there are a lot of ways of doing it, but we didn't want to program everything from start, so we used a shader and a tool to improve it. 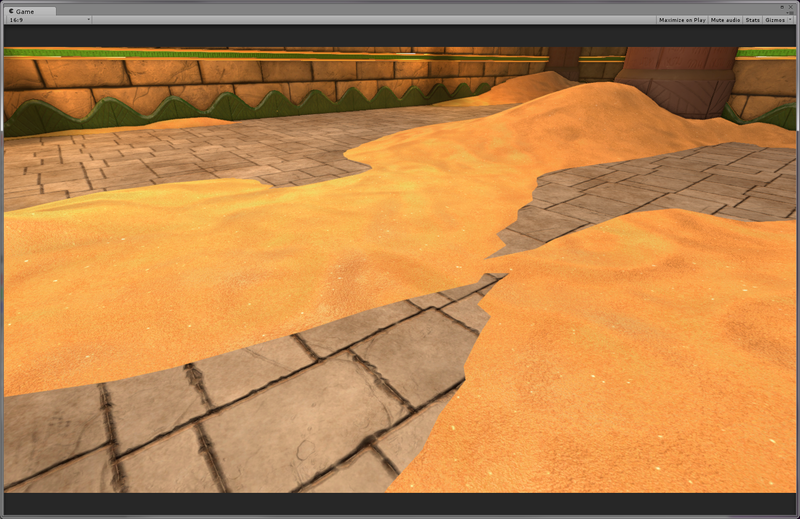 This is how the sand looks without much retouching, just a mesh, the floor and the texture on them. 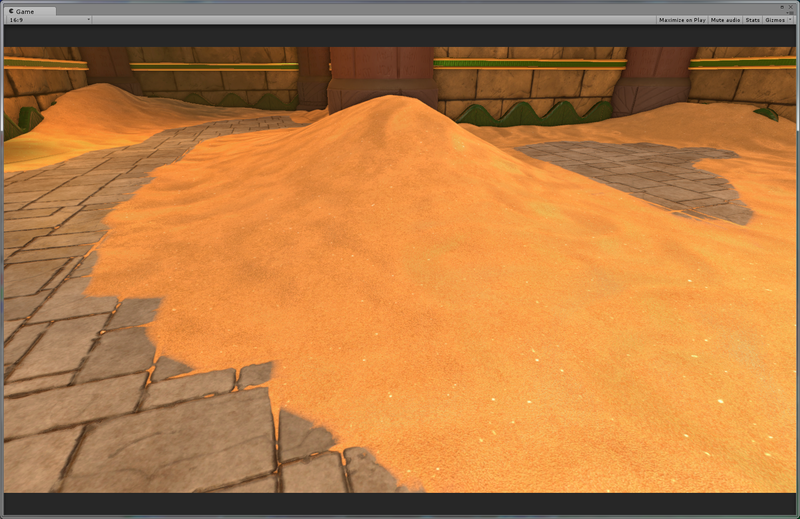 As you can imagine, we didn't want the game to look so bad with the sand acting just like a regular mesh. 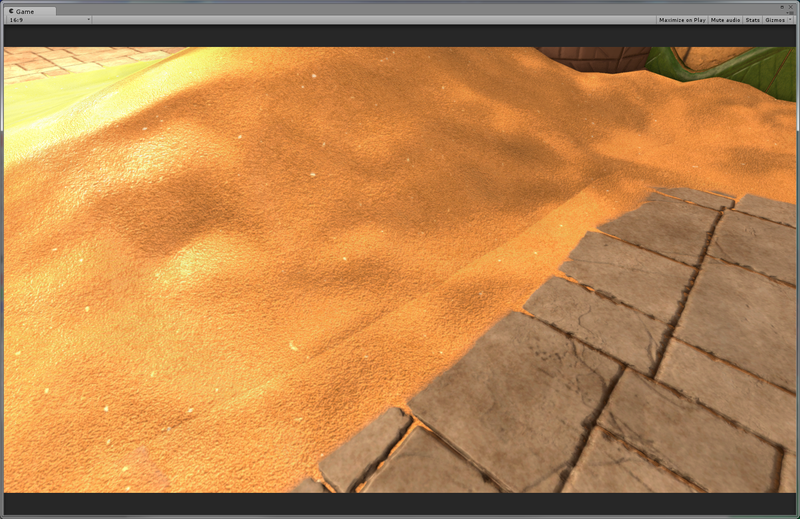 That's why we created a specific shader so the floor and the sand mixed better. 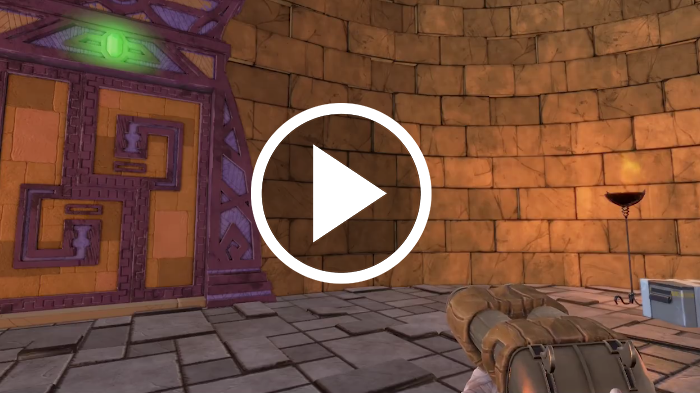 We really wanted the ability to ‘paint’ some surfaces with sand, and to achieve this, we developed a shader that uses the vertex colors to show the correct amout of floor and/or sand. 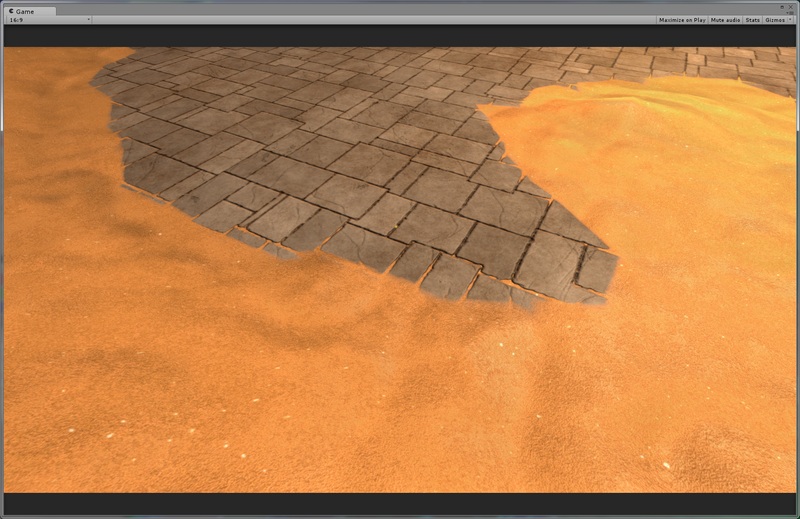 We hated the idea of using the typical blend, so the shader is configured to show the sand texture according to the floor heightmap. Obviously, the texture has a planar projection to ignore the UV mapping so it can tile correctly. 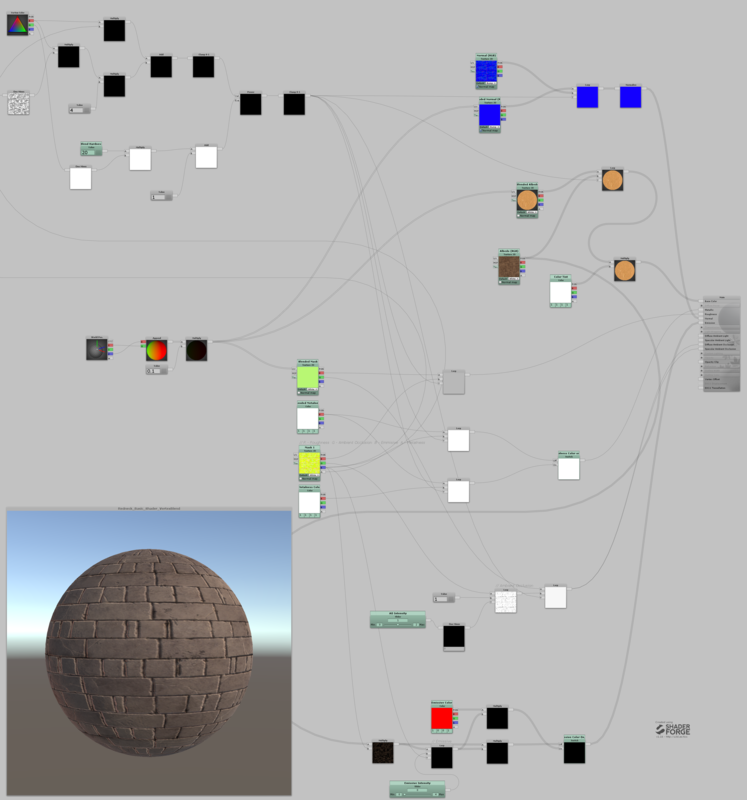 Here’s how it looks in shader forge. And this is how we 'erase' it. Actually, we are just playing with opposed values: black for painting, white por erasing. Now, this is how they looked if we changed all the normals to point vertically. This seemed like the easier solution, but it created strange lights and shadows, so we ended up just changing the vertex normals in the edges of the mesh. In this comparison, you can see what we mean. 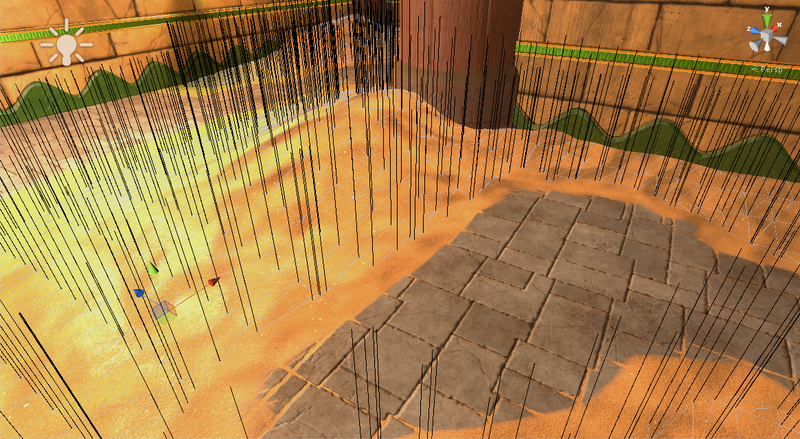 When all the normals were pointing the same way, the sand looked strange. 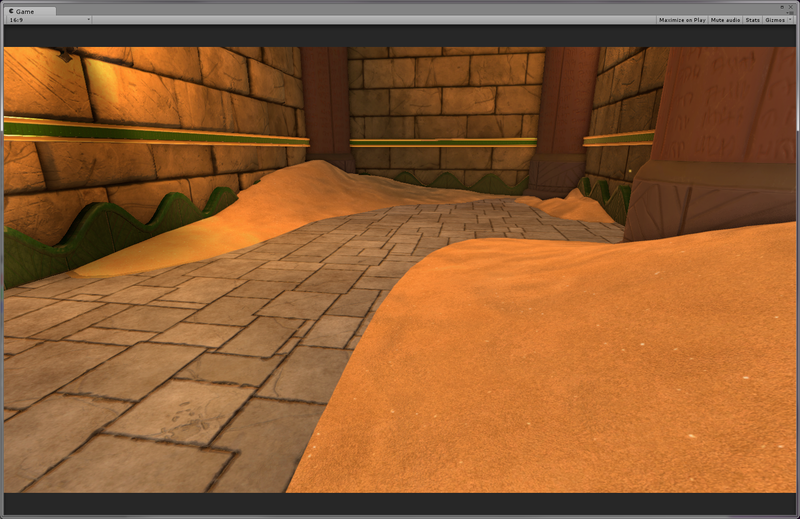 And to finish this maybe excessively long devlog, a few screenshots of the final sand. Thanks for reading and I hope you finded it interesting. We really like how the sand behaves and looks, so we hope you do too. And as always, whatever you think about our work, good or bad, please just say it. It will help us a lot!